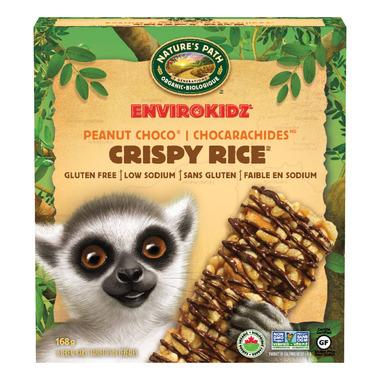 Lemur Peanut Choco Drizzle Crispy Rice Bars are a delectable pairing of chunky peanut butter and peanuts with chocolate drizzle resulting in a fun and yummy flavor with huge kid appeal. Not only does it taste great, it is gluten free, low in sodium (50mg) and low in sugar (8g)! Ingredients: Organic brown rice flour, organic brown rice syrup, organic honey, organic peanut butter, organic chocolatey icing (organic evaporated cane juice, organic palm kernel oil, organic cocoa, natural flavors, organic soy lecithin, sea salt), organic invert cane syrup, organic roasted peanut, organic evaporated cane juice, organic soy oil, organic acacia gum, sea salt, organic molasses, tocopherols (natural vitamin E), organic rice bran extract. Being gluten free is on occasion a pain. I usually make everything but sometimes you just need a snack in your purse when you are out and about and these bars are great. They work as a good pick me up and they don't end up crushed at the bottom of my purse. I found them enjoyable as a quick on the go snack. I was expecting these bars to be more dense, not so light and airy but they're still pretty good. They taste like peanut butter rice crispies treats. These are my go to snack /treat bar. Unlike other gluten free bars that are usually hard as a rock and lacklustre in flavor, these bars are just right in the chewy department and taste wonderful. I just wish the price was a little lower. I really enjoyed these - and they are nice and soft unlike so many others that are hard enough to break your teeth. Has an excellent chocolately peanut butter taste, and nice and crispy also. Not too sweet. did not enjoy this product at all. Just very sugary. Ooh no! not good tasting to me. Had a weird off-putting smell and I didnt enjoy it, I ended up giving the bars away at work. Wont order this brand again.